48 years ago this week, they were filming “For the World is Hollow and I Have Touched the Sky.” Note the image – of Kirk and Spock receiving an electrical shock … yet there is no flash of electricity. This picture shows what it looked like when they filmed the scene. The electrical charge was added later in post production. Did you know this was the most expensive episode produced for the third season? It was also the second of four Season Three episodes to be given a half-page Close-Up listing in TV Guide, America’s top-selling magazine from that time. Read on to see the Close-Up, and find out what the other three episodes were. 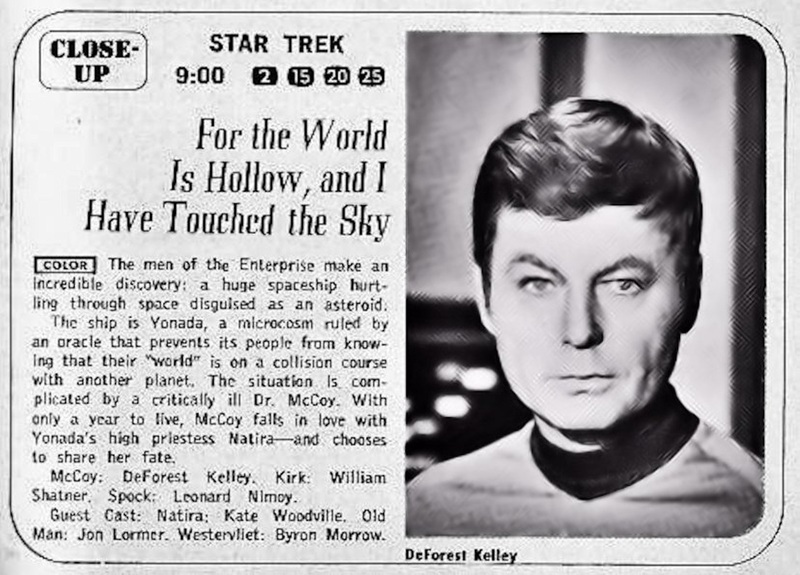 The other three episodes from the third season to be singled out with Close Up listings in TV Guide were “And the Children Shall Lead” (because of the novelty of having famed Attorney Melvin Belli played Gorgan, the Friendly Angel), “The Tholian Web” (because of its Emmy-winning photographic effects) and “Turnabout Intruder” (because it was the last episode of the original series to be filmed and aired). 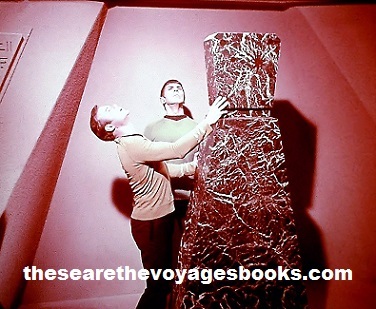 You can see those listings, plus the budgets, the Nielsen ratings, memos from the creative staff and the network, fan letters, and so much more from all the episodes produced in These Are the Voyages, TOS [Star Trek: The Original Series]: Season Three, available here.